238 pages | 70 B/W Illus. 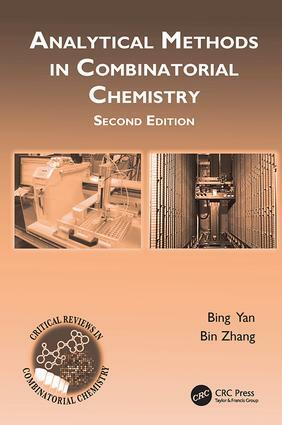 Since the publication of the benchmark first edition of this book, chemical library and combinatorial chemistry methods have developed into mature technologies. There have also been significant shifts in emphasis in combinatorial synthesis. Reflecting the growth in the field and the heightened focus on select areas, Analytical Methods in Combinatorial Chemistry, Second Edition updates a classic text and captures the current state of these technologies. Written by leaders in the field, this second edition includes several enhancements. A chapter on high-throughput analytical methods and informatics reflects the demand for quality control of library members. A new chapter focuses on high-throughput purification methods. All chapters have been updated with new data. The coming decade is sure to usher in a new wave of progress in this critical field. This volume provides not only an analysis of the recent developments in analytical methods, technologies and applications; it also provides a window on future possibilities. Resin support as another "solvent phase"
Bing Yan received his Ph.D. from Columbia University with Koji Nakanishi in 1990. He is a faculty member at the Department of Chemical Biology and Therapeutics at St. Jude Children’s Research Hospital in Memphis, Tennessee, and an adjunct professor at Shandong University. Bin Zhang received his Ph.D. from the Institute of Inorganic and Analytical Chemistry and Radiochemistry at Saarland University (Germany) with Professor Doctor Horst P. Beck in 2003. He is an associate professor of analytical chemistry in the School of Chemistry and Chemical Engineering at Shandong University, China.